The Tibetan Book of the Dead, whose actual title is "The Great Liberation upon Hearing in the Intermediate State" or "Bardo Thodol", is traditionally believed to be the work of the legendary Padma Sambhava in the 8th century A.D. The book acts as a guide for the dead during the state that intervenes death and the next rebirth. He is considered to be one of the first persons to bring Buddhism to Tibet. 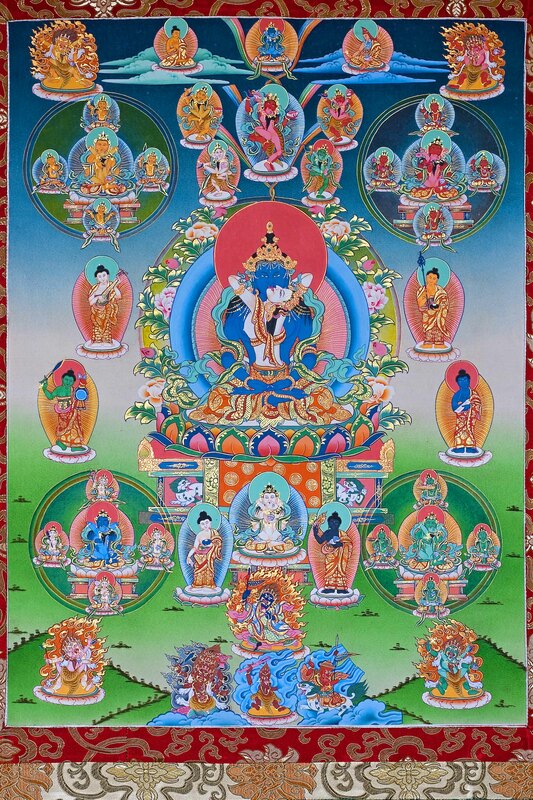 The Bardo Thodol is a guide that is read aloud to the dead while they are in the state between death and reincarnation in order for them to recognize the nature of their mind and attain liberation from the cycle of rebirth. The Bardo Thodol teaches that once awareness is freed from the body, it creates its own reality as one would experience in a dream. This dream occurs in various phases (bardos) in ways both wonderful and terrifying. Overwhelming peaceful and wrathful visions and deities appear. Since the deceased's awareness is in confusion of no longer being connected to a physical body, it needs help and guidance in order that enlightenment and liberation occurs. The Bardo Thodol teaches how we can attain Nirvana by recognizing the heavenly realms instead of entering into the lower realms where the cycle of birth and rebirth continue. The following is a description of the bardo realms that one travels through after death. The first bardo comes at the very moment of death, when there dawns the Clear Light of the Ultimate Reality. This is the very content and substance of the state of liberation, if only the soul can recognize it and act in a way to remain in that state. The instructions intended to be read at the moment of the person's death are designed to help him do this. He is told, first of all, to embrace this supreme experience not in a selfish and egoistic way but rather with love and compassion for all sentient beings. This will aid him in the second step, which is to realize that his own mind and self is identical with the Clear Light, implying that he himself IS the Ultimate Reality, "the All-good Buddha", transcending time, eternity, and all creation. If he can recognize this while in this supreme state at the moment of death, he will attain liberation-that is, he will remain in the Clear Light forever. This condition is called the "Dharmakaya", the highest spiritual body of the Buddha. Most souls, however, will fail to do this. They will be pulled down by the weight of their karma into the second stage of the first bardo, called the Secondary Clear Light seen immediately after death.At this point, there are separate instructions to be read according to the spiritual condition of the person while in life. 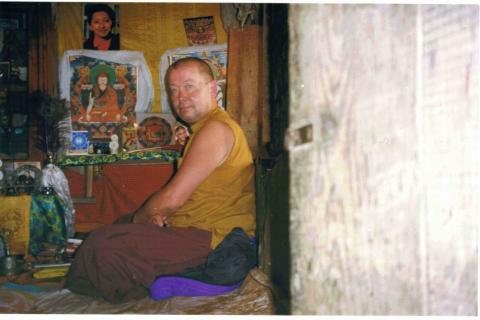 For an individual advanced in meditation and other spiritual practices, there is repeated over and over the same instructions as at the moment of death, enjoining him to recognize himself as the Dharmakaya.For a person who was still at a student-level on the spiritual path, there is the injunction for him to meditate on his "tutelary deity", that is, the particular god for whom he performed devotional practices while alive. Finally,"if the deceased be of the common folk", unpracticed in any spiritual disciplines, the instruction is to "meditate upon the Great Compassionate Lord", which is to say an "Avatar" worshipped by the multitude, equivalent to Jesus as conceived by the average Christian. If the soul is still not liberated at this stage, it will descend into the second bardo, which is said to last for two weeks. The second bardo is also divided into two parts; in the first, the soul of the deceased encounters what are referred to as "the Peaceful Deities. "On each of the seven days, a particular Buddha-being will appear in radiance and glory, with a bevy of angelic attendants. At the same time, on each day in turn there will shine a light from one of the six worlds of the Buddhist universe, called"Lokas" (the basic meaning is "place";our English words "location" and "locale" are derived from the same Sanskrit root). On the first day of the second bardo, there appears to the soul the divine Father-Mother - that is, the supreme deity of the universe, transcending all dualities, including the division into sexes. The next step in the destiny of the soul is determined by his reaction to this God. If his life on Earth was well lived, he will now be in a state of purity and grace, and he will enter into the joy of the God and attain liberation. If on the other hand he has lived an ignoble and impious life, the effects of his bad karma will cause the intense radiant presence of the God to strike fear and terror in his heart, and he will be drawn instead to the softer light of the Deva-Loka, which has dawned along with this deity. This is still a fairly attractive fate, for the Devas are the Gods (or angels), and their Loka is equivalent to the Christian heaven; however, the Buddhist teaching is that even heaven is not the highest spiritual objective, because it is still only a temporary state in the manifest universe. Liberation is believed to be the only final and permanent resting-place for the soul, an un-manifest state beyond all existence. On the second day, there appears the second-highest God in the Buddhist pantheon - in fact, he is actually the Second Person in the literal Buddhist Holy Trinity. At the same time, there dawns a smoky light from hell; and here we note that, just as the Buddhist heaven is not a permanent, eternal state, neither is its hell. Even the most wretched souls will eventually work their way out of even the deepest pit of hell, just as even the highest and purest souls will eventually lose their footing in heaven and descend again into the cycle of death and rebirth. Liberation is the only way out. Once again, if the soul responds to the "dazzling white light"of the second God with the joy of a pure heart, he will be liberated thereby; but if he specifically reacts with ANGER from having indulged in this vice on Earth, he will recoil from the light in fear and be drawn into hell. The pattern is repeated on the third day; this time it is the fault if egotism that will cause the soul to react to the God with fear, and he will be drawn to the human world, where his next incarnation will thereby take place. On the fourth day dawns the God of Eternal Life; if the soul has a negative reaction to him because of miserliness and attachment, he will be drawn toward rebirth in the Preta-Loka, a world of"hungry ghosts"who have huge stomachs and throats the size of pinholes, and so they wander about in a constant state of unsatisfied ravenous desire. On the fifth day comes God in the form of an Almighty Conqueror; this time it's jealousy that will unseat the soul, and he will be born into the Asura-Loka, a world of fierce warrior-deities (or demons). On the sixth day all the deities return and dawn together, along with the lights from all six Lokas. On the seventh day there appear the Knowledge-Holding Deities, who are more fierce and demonic-looking than those that have previously dawned;and in fact they are sort of a transitional element to the next stage of the second bardo, where the soul encounters the wrathful deities. Meanwhile, if because of stupidity the soul cannot face the Knowledge-Holding Deities, he is drawn toward the Brute-Loka - that is, he will be reborn on Earth as an animal. In the second week of the second bardo, the soul meets seven legions of Wrathful Deities: hideous, terrifying demons who advance upon him with flame and sword, drinking blood from human skulls, threatening to wreak unmerciful torture upon him, to maim, disembowel, decapitate and slay him.The natural tendency, of course, is for the soul to attempt to flee from these beings in stark, screaming, blood-curdled terror;but if he does, all is lost. The instructions at this stage of the Bardo are for the soul to have no fear, but rather to recognize that the Wrathful Deities are really the Peaceful Deities in disguise, their dark side manifesting as a result of his own evil karma. The soul is told to calmly face each demon in turn and visualize it as the deity it truly is, or else as his own tutelary deity; if he can do this, he will merge with the being and attain the second degree of Liberation, that lesser aspect of it which is now the best he can hope for here in the second bardo. Furthermore, he is told to awaken to the fact that all these fearsome creatures are not real, but are merely illusions emanating from his own mind. If he can recognize this, they will vanish and he will be liberated.If he can't, he eventually wanders down to the third bardo. In the third bardo the soul encounters the Lord of Death, a fearsome demonic deity who appears in smoke and fire, and subjects the soul to a Judgment. If the dead person protests that he has done no evil, the Lord of Death holds up before him the Mirror of Karma, "wherein every good and evil act is vividly reflected." Now demons approach and begin to inflict torments and punishments upon the soul for his evil deeds. The instructions in the Bardo Thodol are for him to attempt to recognize the Voidness of all these beings, including the Lord of Death himself; the dead person is told that this entire scene unfolding around him is a projection from his own mind. Even here he can attain liberation by recognizing this. The soul who is still not liberated after the Judgment will now be drawn remorselessly toward rebirth. The lights of the six Lokas will dawn again; into one of these worlds the soul must be born, and the light of the one he is destined for will shine more brightly than the others.The soul is still experiencing the frightening apparitions and sufferings of the third bardo, and he feels that he will do anything to escape from this condition. He will seek shelter in what appear to be caves or hiding-places, but which are actually the entrances to wombs. He is warned of this by the text of the Bardo Thodol, and urged not to enter them, but to meditate upon the Clear Light instead; for it is still possible for him to achieve the third degree of liberation and avoid rebirth. Finally there comes a point where it is no longer possible to attain liberation, and after this the soul is given instructions on how to choose the best womb for a favorable incarnation. The basic method is non-attachment:to try to rise above both attraction to worldly pleasures and repulsion from worldly ills. The final words of the Bardo Thodol are: "Let virtue and goodness be perfected in every way."